In order to give a unity to the numerous collaborations in the area of Málaga, for the 2013/2014 season we have scheduled a series of monthly tours with artists from Malaga performing together with international musicians. A varied program will be offered throughout many cities thanks to the collaboration of various institutions, hoping to offer a considerable contribution to the cultural agenda of this province and the professional training of many young artists. There will be performances of chamber music ensembles, soloists, and the Promúsica Youth Orchestra, which will be the Orchestra-in-residence for this series in its 2014/2015 season, thus also giving the opportunity to perform as soloists to many young musicians. 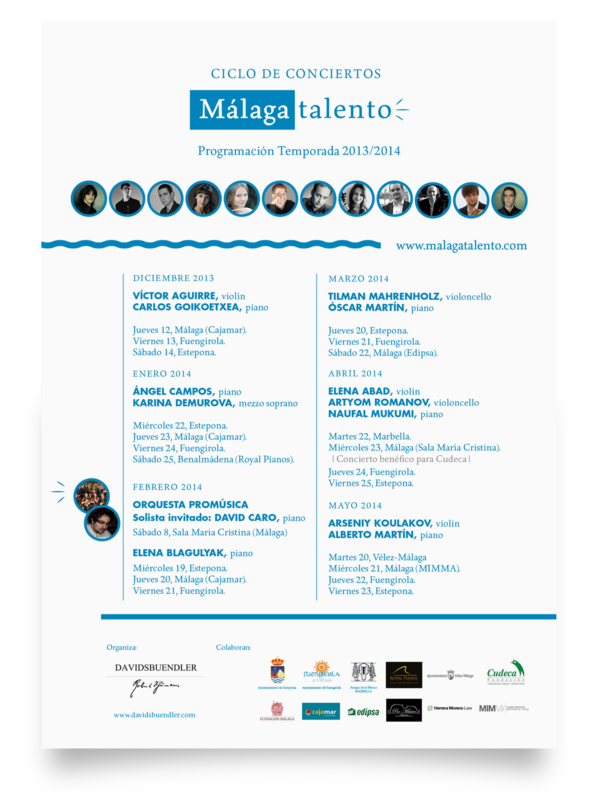 We have tried to programme these concerts with a particular emphasis on inviting young artists from Malaga who, thanks to their special talent, are studying at internationally renowned music schools, thus trying to make them preserve an intense bond with Malaga’s cultural scene despite their residence in other countries. Also, in order to add an element of variety and increase the interest of the series, most of them will share the stage with other young international guests, thus opening the doors to the musical scene in Spain to artists from many different countries.